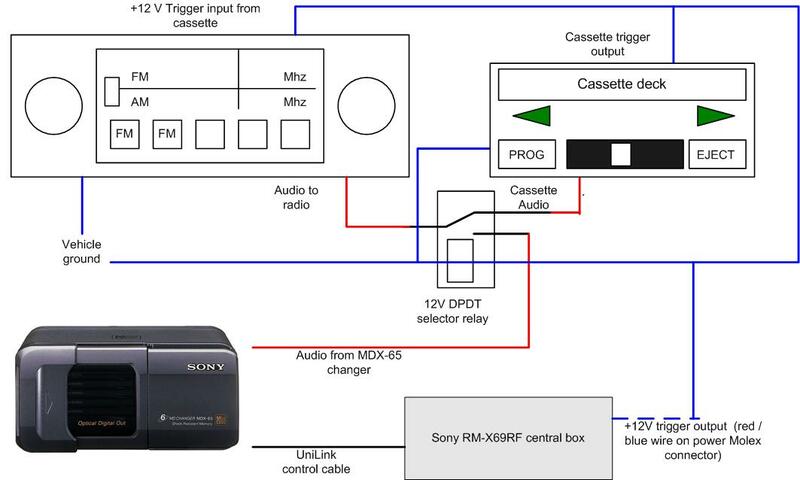 This document describes the connection of a Sony RM-X69RF controller for Sony's Unilink CD/MD changers to an existing car stereo without using an antenna based connection method. This is desirable because it avoids having to allocate an FM preset on the radio to the controller's output frequency; and you are able to enjoy one-touch source selection with the controller in the same way that you would with the existing car sound system's equipment. You also achieve better quality sound from the CDs or MDs that are in the changer through this "direct-to-amplifier" connection than via the RF signal path that would be used if you followed the connection setup in the controller's documentation. From the discussions that I had on the MD-L list during 2000 regarding the Sony RM-X69RF CD/MD changer controller and the search for an alternative to RF modulator setups for add-on car MD player installations to existing car stereo systems, I have found that there is really no need to use the RF modulator to send audio from a Sony MD or CD changer hooked up to this controller into the car stereo system. This approach is of use if you want to maintain the factory-supplied car sound system in a high-specification vehicle made from the late 70s through to the mid-90s (such as the Mazda RX-7) but play CDs or MiniDiscs in this vehicle. The only modification to the dashboard would be the display unit for the changer controller - this could be effectively fitted into a space on the dashboard for example. This connection approach can also be taken with some classic radio / cassette head units that were made during the 80s, such as the Concord and the Nakamichi units that featured auxiliary inputs for other devices. To be relevant to the Minidisc world, I will be using the Sony MDX-65 MiniDisc changer as the example changer device for the installation, but any Sony Unilink compatible changer will work. A setup where there is an AM / FM stereo radio and a separate tape deck. The sound for the tape playing in the deck must be adjusted using the volume, tone and balance controls on the radio. In some vehicles, the tape deck may be sold as a dealer-supplied optional extra or only available in higher-specification (i.e. more expensive) packages. You can know if this is true if the car-audio chapter of the car's instruction manual describes a tape deck that has no volume and tone controls -- you adjust the volume and tone on the radio. Also some vehicles may use this setup but have the installation appear as though it is a one-piece double-height radio-cassette unit. A setup with a radio / cassette unit that has an auxiliary input for a CD player or other device. A setup where there is a radio / cassette unit or separate radio and tape deck and a separate graphic equaliser. The signal being fed to the graphic equaliser must be a "fixed-level" signal that is not adjustable by the volume or balance controls on the head unit -- the head unit controls only adjust the signal returning from the equaliser. To be a suitable candidate, your equaliser's level meters or a spectrum analyser display should not vary when you adjust the volume control for your system. Another way to test is to inject a signal from a different source that has a known level into the equaliser with the system on and identify whether adjusting the head unit's volume control affects the volume of the different source. If it does, your system is suitable. The Sony RM-X69RF kit includes a display unit, central box, IR remote control, plus some associated cables. The central box is connected to the display and you connect the MDX-65 changer to the central box using the UniLink cable only. The RCA sockets on the central box are for use if you are using the RF modulator and you won't need them for this exercise. Also you won't use the antenna connectors on the central box because these are for use with the RF modulator. There is a four-way power cable terminating in a Molex plug that plugs into the central box. The blue-red cable, represented on the diagram by a dotted blue line emanating from the grey box on the diagram is the "trigger cable". This provides +12 volts when you activate the controller and is used to "wake up" the car radio or re-route the signal. To route the audio into the system, you connect the RCA cables from the MiniDisc changer directly to the AUX or TAPE input on the radio if the inputs are vacant. For a system where there is a source (tape or CD player) that is fed to the radio, or a system that is using a graphic equaliser, you will need a DPDT relay that has a 12-volt coil. This relay's coil is to be connected to the "trigger cable" and is operated when the changer controller is turned on. You connect the existing source's audio "hot connections" (tip of RCA/Cinch connector) to the relay's N.C. (normally closed) contacts and the MiniDisc changer's "hot connections" to the N.O. (normally open) contacts. You connect the relay's C.O. (changeover) contacts to the radio's AUX or TAPE input. The audio signal's common or ground connectors are connected directly to the radio. You may have to wire both the ground signals from the MD changer together if the tape or CD uses a three-wire audio connector. In the case of an equaliser setup, you would connect the MD changer to the relay's N.O contacts and the radio's output to the N.C. contacts, and the changeover contacts to the equaliser's input. This causes the MD signal to pass through the equaliser. Some installations, namely the radio-cassette / equaliser setups, may not be able to be automatically switched on because there won't be any way for external devices to signal to the radio that they are on. But other installations use one of two different forms of signalling to "wake up" the car radio and open the external-source input. One is to supply the radio with a +12 volt "trigger current" at a special connection used for this purpose. The other is for the tape deck or CD player to "short to ground" the trigger input on the radio. This is similar to how mobile-phone handsfree kits and carphones trigger the automatic radio mute facility during a phone call and involves the device shorting the trigger input to the car's chassis ground. In the first method, you wire the trigger cable to the radio's "trigger input". This trigger cable would would also run to the relay that is used to select between the MiniDisc changer and the existing car-audio device. In the second method, you need to use a second relay - an SPST relay with a 12 volt coil. The relay coil is wired to the trigger cable and the contacts are wired between the radio's "trigger input" and a ground point in the vehicle, such as a part of the chassis. In a "multi-device" setup, you will need to wire the relay coils in parallel, with both of them connected to the "trigger cable" and run the trigger signal in parallel to the existing device's trigger connection. Then you can run the power connections to the changer and controller and, hopefully, the installation should work. This means that you should be able to hear your MiniDiscs via the car radio using this controller without having to tune in a particular station every time.